Creations Unlimited Flex-I-File Combo Set Frame w/8 Each Fine, Medium & Coarse Tapes, 1 Bonus Tape. 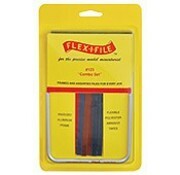 Flex-I-File gets into spaces that other tools cannot. Fitting perfectly into tight corners and interior angles even the tightest spot isn’t out of reach. Eliminate imperfections on your project by gradually progressing through the grits from coarse to fine. Includes frame with eight each fine, medium and coarse mylar polyester tapes, plus one bonus tape on frame.